I also hate rolling dough. It's sticky, it's frustrating and it takes some serious work - and in the past all that work has lead to less than stellar results. 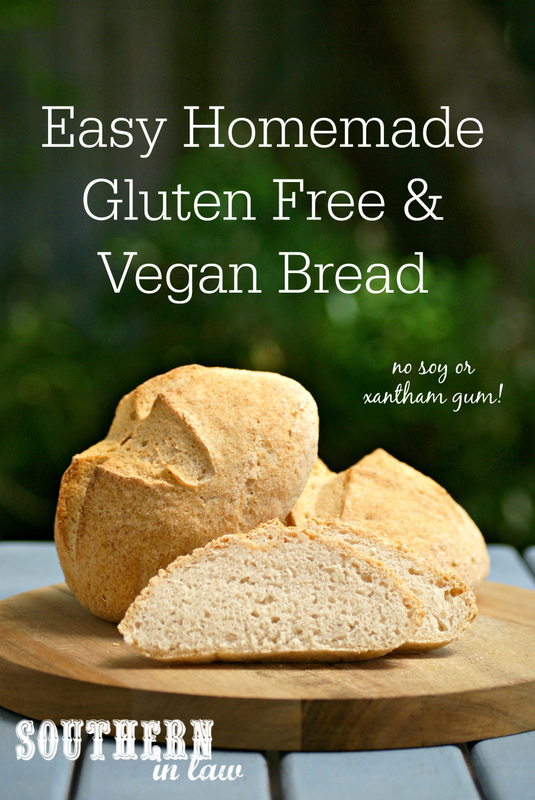 All that hatred is why it's 110% safe to say that this may be the easiest bread recipe ever. You see, the kneading is minimal and the end results are seriously ridiculously good. This Homemade Bread Recipe was one of my stupid sounding ideas that just happened to turn out wonderfully. You see, when you've had some SERIOUS bread fails in the past, you probably shouldn't try to turn the bread game on it's head - but I did just that. Super ridiculously easy to make. And somehow I managed to nail it on the first try. It's actually SO good that Jesse doesn't think you're going to believe a word I say as he's never tried gluten free bread that tastes so good. Sure, it takes some time (well, a fair bit of time - but that time is where you leave the bread to do it's thang and you get on with whatever it is you feel like doing) but it's worth every second when you have crusty delicious gluten free AND vegan bread that's made with ingredients you can pronounce and doesn't taste disgusting. In fact, it's so good that Jesse asked me if he could eat an ENTIRE LOAF for dessert. Unfortunately for him, I said no - but that was only because it meant less bread for me. The recipe I'm sharing with you today makes two small loaves, however, we've found ourselves doubling the recipe and making four small loaves so we can slice and freeze the bread to use later. It's more of a sourdough style bread in that it's not super soft and fluffy (like a Wonder White kinda bread) - but that means it's perfect for toasting or bruschetta style creations! In a large mixing bowl, add your flours, starch, psyllium and mix until combined. Take out 1/4 cup of your flour mix and set it aside. Combine your warm water with your yeast and honey/maple syrup and add to your dry ingredients. Mix your ingredients by hand or with a mixer until combined. Once all of your dry ingredients are incorporated, cover your bowl with cling wrap, leaving a small air hole by exposing one of the sides (alternatively, poke a few holes in the top - you want to make sure your dough has enough air without having too much that it dries out). Leave your dough in a warm place to rise for 2 hours. Once your dough has risen, sprinkle your extra flour over the top and knead until smooth. If your dough feels too dry to knead, add ~1/8-1/4 cup of water. 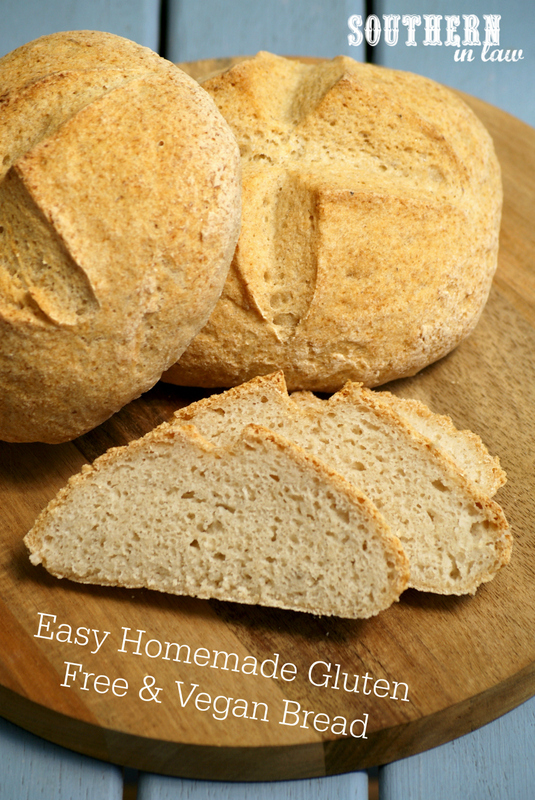 Divide your dough into two balls and shape and smooth the dough into two small round loaves with your hands. 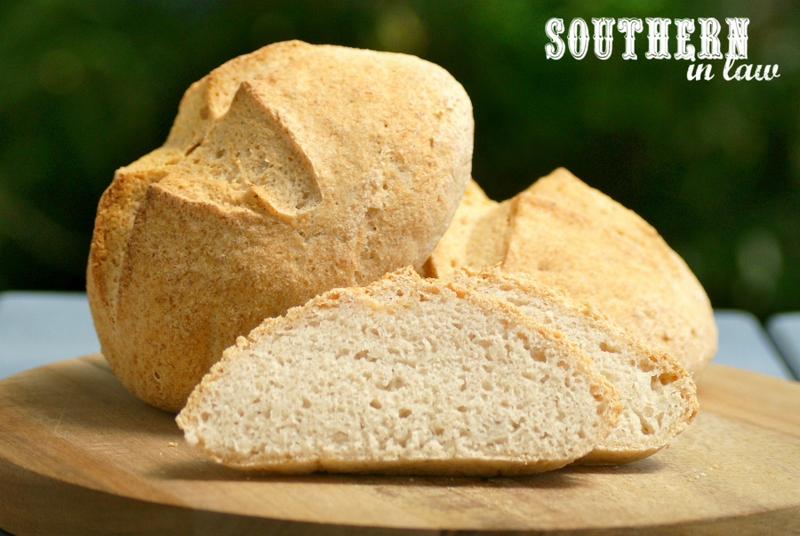 Ensure the surface of your dough is smooth and there's no big cracks (this allows it to rise better) and place your shaped loaf onto a piece of baking paper. Repeat with the second lot of dough and loosely cover your loaves with cling wrap. Allow your dough to rise again for another hour whilst heating your oven. We bake our bread on pizza/baking stones for a crispier crust, however, you can bake your bread on a regular oven tray. Simply place your tray or stones in the oven and preheat to 230C/445F. 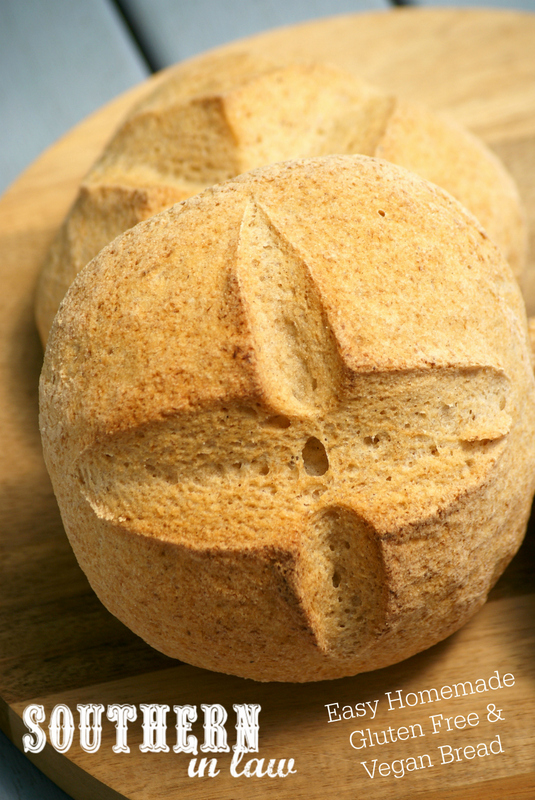 When your loaves are almost finished rising, boil your kettle or boil some water to create a water bath in a few minutes. Once your loaves have risen for an hour, carefully slice an X in the top with a sharp knife (serrated knives make this super easy) and carefully pick up the baking paper your loaves are sitting on and place them onto your hot tray/baking stone. Place an baking dish in the bottom of your oven and fill with boiling water until around halfway full - this creates steam to keep the oven humid and moist and give you a better loaf at the end!). Bake your bread for ~45 minutes or until your loaves are golden and sound hollow when tapped on the bottom. Remove from the oven and allow to cool completely before slicing (this is THE HARDEST PART as your kitchen will smell amazing and you'll want to eat it all right this second but trust me - if you allow it to cool your bread won't be soggy and gummy inside and your heart and tummy will be much much happier). This bread can be kept for 3-4 days at room temperature, however, is best in the first few days. Freeze any bread you won't use immediately by slicing your loaves and freezing the sliced bread either as a whole or in individual ziplock bags to defrost and enjoy later. Note: This is a denser, more sourdough-like bread as you can see in the picture and not a super soft wonderbread style sandwich loaf (though we use it for sandwiches!). But tell me, have you ever tried making homemade bread? What's one recipe you wish was so much easier? !